It's no big secret that I am obssed with mystical things. Zodiac signs, Tarot cards, palm reading, crystals GIVE ME IT ALL. So this gift guide is for anyone in your life who also may have similar interested. I am building a pretty sweet collection of necklaces with zodiac signs and constellations on them. I love these selections because they are simple enough to fit any personal style and are great for layering with longer chains or chokers. I just got this dress in the navy hue and I am absolutely obsessed. I've seen similar dresses for triple the price tag. I love that it comes in both colors and the mixed media embroidery of constellations, suns and moons. If you want a looser fit like shown above I would size up! It has adjustable straps and slight stretch. I don't anyone who doesn't love a fun mug. This gift is great for a co-worker. It's personal, gender neutral, perfect for work and budget friendly. Add the fixings for hot chocolate or some tea bags to jazz it up! Traditionally a person's first tarot card deck should be gifted to them. 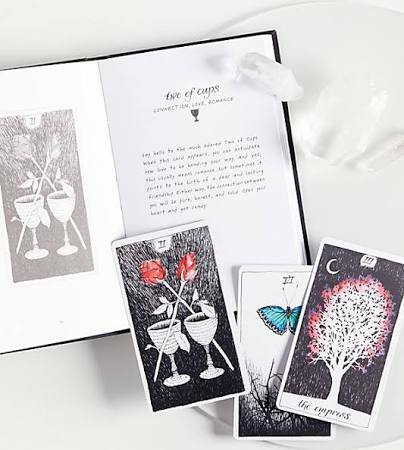 If you have a friend or family member who has expressed interest in tarot then this is the gift for them. In the linked decks below all the artwork is original as well so go with your gut and what you think they will connect with most. This is for the crystal lover and collector. This item is incredibly unique and one of a kind. Every time I am out and about my bottle I get so many questions and compliments on it. The bottle comes in your choice of 4 different crystals to choose from and was created by a woman in Colorado. It's amazing to have watched her business grow into major retail stores. Below is a breakdown on the crystal choices to help you choose. Clear Quartz: The stone of ultimate wisdom and total clarity. It harnesses the balancing energy of positivity, healing, connection, and wisdom. Rose Quartz: The stone of unconditional love. It harnesses the feminine energy of compassion, love, peace, tenderness, healing and nourishment. Amethyst: The stone of balance and protection. It harnesses the energy of creativity, spirituality, and passion. Smoky Quartz: The stone of grounding, relaxation, protection and power. Smoky quartz elixirs are perfect for the ambitious and are known to help relieve anxiety.